February 13, 2018 Dan O. As long as you get consent, throw your art literally anywhere. ing, and why someone like JR fascinates her so much. It all goes back to her own career, her relationship with one Jean-Luc Godard, and most importantly, when she believes is her time to finally hang it all up and be done with everything. Faces Places is such a joyous and easygoing little movie, that even when it seems like it’s stretching itself beyond its own ambitions, it’s still hard to be mad at it. It’s a movie that’s about art, life, love, and passion, all coming together in a sense that makes you realize the lives we live are important, our stories need to be told, and why the world we live in, for all the hatred, anger, violence, and sadness that can usually exist, is still an original and beautiful place to live in. If that doesn’t bring at least something of a smile, or better yet, a tear to your face, then I have no clue what will. And it’s odd, too, because Varda’s films, whether narrative or not, have typically been rather sad, depressing affairs. Not all of them, of course, but typically, they’re downtrodden and upsetting movies about the sadder-aspects of reality that are unflinching and honest as can be. But word on the street is that Faces Places may just be her last film – what with her deteriorating eyesight and health overall – so it makes sense that she looks back on her life, her career, her decisions, her mistakes, and the world she may soon be leaving behind, with a smirk, as opposed to a frown and a middle-finger. Looks a little too much like Slenderman. May wanna rethink it. Of course, though, it’s not just Varda’s story, mind you. Also here is JR who, like her good buddy Godard, is a bit of an odd mystery; we’re never quite sure if he’s playing up a role, or if he is genuinely just this artistic and a little pretentious. Regardless, the man is still charming and incredibly talented as hell, utilizing his skill for photography and paste-art to create some truly magnificent and beautiful images, most of which won’t last more than a day. Varda is clearly in awe of this man, his craft, and the inspiration he brings to the world of art and creativity, which is why it’s nice whenever she does compared him to Godard, with it not always being too clear with the inspirations start and begin. But like I said, Faces Places is a joyous little movie that discusses certain people’s lives, their significance, and why there’s millions and millions more out there. 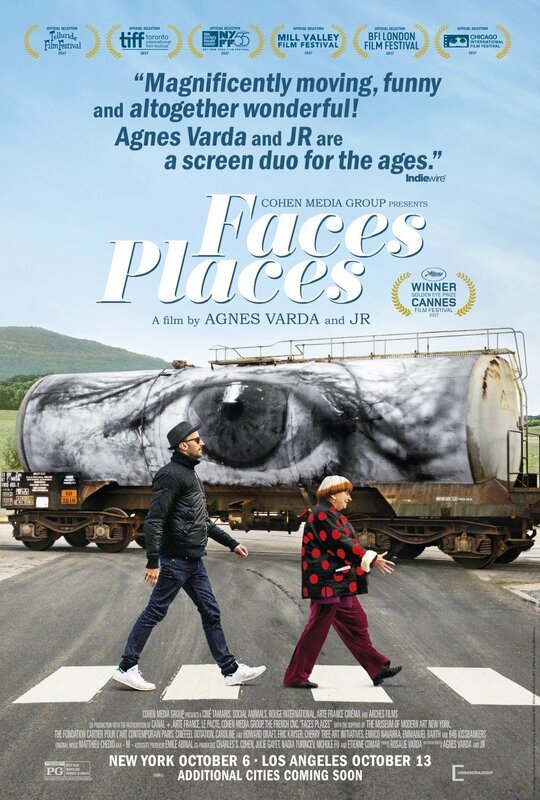 Faces Places gets a little stuck in the mud when Varda decides to stage certain conversations and scenes, which is why the movie can sometimes feel like a “documentary in retrospect”, but mostly always ends a scene on a heartwarming note that reminds you of the happiness and sometimes, sadness that exists in this world. And without Varda in said world, it’s going to be a bit gloomier, but thankfully and hopefully, JR will be there to pick up the pieces, put some glue on them, and throw them on whatever firm object he can spot. As long as it’s not my walls, I’m fine with wherever he decides. Consensus: Sweet, heartfelt, and a little sad, Faces Places is the possible swan song for Varda that reminds us of her influence, as well as the our own lives and why every story matters.